A Guide To Solving the 2 Most Common Nutrient Deficiencies That Affect 80%+ of Westerners. In this post you will learn the 2 vitamins & minerals you most likely are deficient in regardless of diet that are not only very important for good health but also easy to fix. Since I have been reading nutrition/health books and research for a few years as almost a part time job, while also spending a lot of time & money on supplements and blood tests, I often get friends asking me what supplements could help them with X or Y health benefit. While it’s true that some vitamins can help you more with certain benefits, overall you want to avoid ANY vitamin/mineral deficiency as sooner (cramps, low energy) or later (your DNA won’t repair itself well, cancer, skin aging faster) it will cause trouble. While most nutrient deficiencies can & should be corrected with a proper diet, some of these can be very hard in our modern days, especially these 2 which affected me and probably most of you, Vitamin D & Magnesium. This is a preview of the A Guide To Solving the 2 Most Common Nutrient Deficiencies That Affect 80%+ of Westerners. 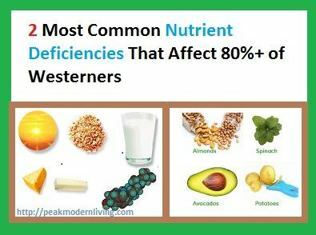 article, you can read more about this article here : A Guide To Solving the 2 Most Common Nutrient Deficiencies That Affect 80%+ of Westerners. Vitamin D Deficiency Symptoms – You Might be at Risk Even if You Go Outside! I think a lot more people nowadays are aware of vitamin D deficiency symptoms and how most people are actually deficient in this even if they go outside a few hours a day due to having clothes on & not living near the equator (where the sun strikes at an angle that hits your skin the hardest). A study showed that ~46% of UK people aged 45 were deficient in vitamin D (under 40(OH)D nmol/L) during winter & spring months. Finally, if you wear sunscreen your vitamin D production from UVB rays is reduced by ~90% or more! I also have to mention how even those that do supplement in vitamin D probably take too little and how you can find your proper dosage. Vitamin D is actually not really a vitamin, it’s a hormone that the sun stimulates your body into producing after your skin comes into contact with the sun’s rays and this process actually takes a while (hours) between production and its complete absorption inside our skin. For that reason its important to mention that it might be preferable to NOT go swim/shower after a good 10-30 min exposure of sun if you worry about your vitamin D levels. While this research is not full proof, it does seem that water/showers can wash away vitamin D on our skin before we absorb it so I do mention it for those like me that enjoy reading at the swimming pool everyday for some morning sun.. If you also like to go swim at the same time, you might be hurting your goal of absorbing natural vitamin D.
Vitamin D (and magnesium) is one of those vitamins that’s responsible for a LOT of things and makes a huge difference once you are at adequate levels. The biggest? I practically almost never get colds now… And when I do the symptoms are quite mild. This might partly be one of the benefits of vitamin C from the high amount in my diet from all the vegetables I eat but in my friends that do not eat “as well” as me (aka grains/baked goods devoid of vitamins/minerals), they still saw huge improvements from taking vitamin D supplements. The other more well known benefit nowadays is directly related to calcium and bones. Most people have been hammered to death, especially by milk advertisements, how calcium is good for growing tall and strong… The truth is, yes calcium is useful but without other important nutrients such as vitamin D, Magnesium and vitamin K2 it does not work optimally. This is a preview of the Vitamin D Deficiency Symptoms – You Might be at Risk Even if You Go Outside! 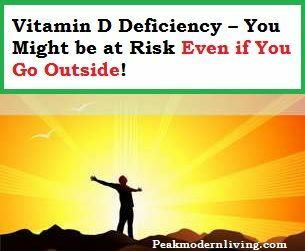 article, you can read more about this article here : Vitamin D Deficiency Symptoms – You Might be at Risk Even if You Go Outside! Magnesium is out there with vitamin D and omega 3’s as something almost everyone needs to supplement with. Originally, humans were gaining a lot of their daily magnesium intake from water but nowadays because of industrialization and water filtering most of the magnesium is removed. Some people in rural towns might also have “hard water” problems where minerals destroy the plumbing over time so they remove naturally occurring minerals (including magnesium of course) to preserve the plumbing but harm the minerals in their drinking water! Most likely you are under the RDA for magnesium unless you eat a ridiculous amount of magnesium rich foods such as spinach (my favorite) and are drinking spring water. Even then, most soil is depleted of magnesium which makes it even harder to realistically expect you are getting as much magnesium in your food as you might think from watching a nutrition counter such as http://cronometer.com/. 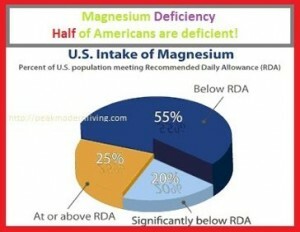 The USDA say that over half of the people living in the US are under the RDA for magnesium which is actually too low to start with. A serious Vitamin B12 deficiency called Hypocobalaminemia can cause severe and irreversible damage to the brain and nervous system if not treated in a timely manner, and if serious enough and left untreated can even lead to death. Luckily the body has the ability to store sufficient amounts of Vitamin B12 for long periods of time and may be reabsorbed. However, recent studies have effectively proven that most deficiencies are as a result of poor absorption ability, not low consumption. Many foods we buy today are fortified with vitamin b12 because it is such an important vitamin and is usually only found in meats and foods of animal origin such as milk and eggs, leaving vegans and vegetarians at risk for deficiency. But studies have also shown that a very large portion of the population, vegetarians and non-vegetarians, and more than was originally thought, are vitamin B12 deficient. This indicates that vitamin b12 is more difficult to absorb through regular ingestion than we like to think. 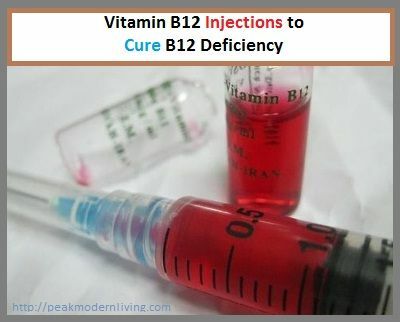 Before describing the vitamin B12 deficiency symptoms in more details I will explain the most common symptom related to B12 (which might have brought most of you to this page) which is a lack of energy. No wonder if you look at the nutritional label of energy drinks like Red bull, they overdose you on vitamin B12! Also, if you are a vegan (0 animal products), this might be another red signal that you are deficient in Vitamin B12 since it comes mostly from animal products. Vegetarians at the very least can eat eggs (ideally pastured free range eggs) or which are very high in vitamin B12 and highly recommended (milk/cheese also good). 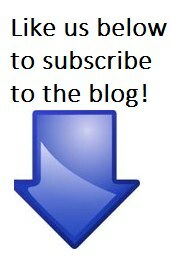 Your other alternatives, given in more details later, are supplements and injections. This is a preview of the Vitamin B12 Deficiency Symptoms – How to Fight Them! 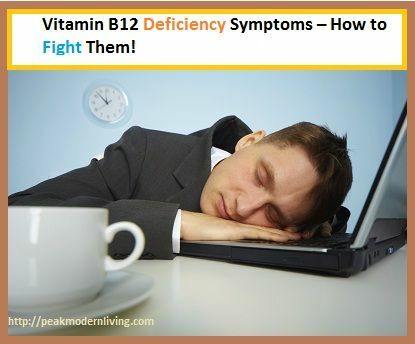 article, you can read more about this article here : Vitamin B12 Deficiency Symptoms – How to Fight Them! Zinc is one of the most important dietary minerals that our body needs because it supports a lot of important functions in the human body. Zinc, like other important minerals such as magnesium, contributes directly in the activity of the enzymes. There are more than 300 enzymes that depend on zinc. 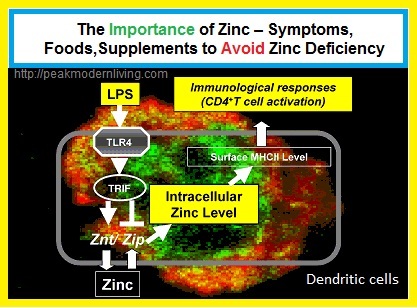 Immune Function: Zinc is key to proper T cell and natural killer cell functions that helps boost our immune system by producing antibodies to fight infections. It fights off colds and sore throats and recovers from injury, illness, or surgery. It also helps in chemical detoxification. Skin Health: Zinc helps in healing wounds faster and maintains our skin healthy. According to a research done to young men by feeding them with foods low in zinc it caused some skin related health problems like acne, facial rash and foot fungus.